The Flash is a regimental distinction of the Royal Welch Fusiliers that is shared by no other regiment in the British Army. It Dates back to the early 18th century when soldiers wore their hair in a braided queue which was held in a bag to avoid the grease soiling the back of the uniform coat. 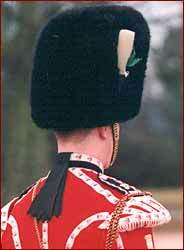 The wearing of the queue was abolished by 1808, yet the Royal Welch Fusiliers ignored the order to remove the five black ribbons from the collar of their coats. As they were stationed in Nova Scotia at the time, there was little notice taken of their disobedience, but on returning to England in 1834, an inspecting General ordered the ribbons removed, and an appeal was made by the regiment to King William IV. In the same year the Royal Welch Fusiliers were granted the right to wear “The Flash” as a regimental distinction and have worn it ever since.